When looking at the majority of historical photos, it might seem that the world was black-and-white and all we had were wars and disease. However, Bored Panda has gone back in time, and dug out some of the most heartwarming and adorable photos from days gone by. From a boy receiving a puppy as a present from his grandad, a hospital-bound girl being cured by ducklings, a Victorian couple cracking up as they try and take the 19th century’s equivalent of a selfie, and many others, these photos will certainly bring a smile to your face. And best of all, these delightful photos show that despite being from a different era, one things hasn’t changed over the years - it’s still the little things that matter. #3 Marine Sergeant Frank Praytor Feeding An Orphaned Kitten. 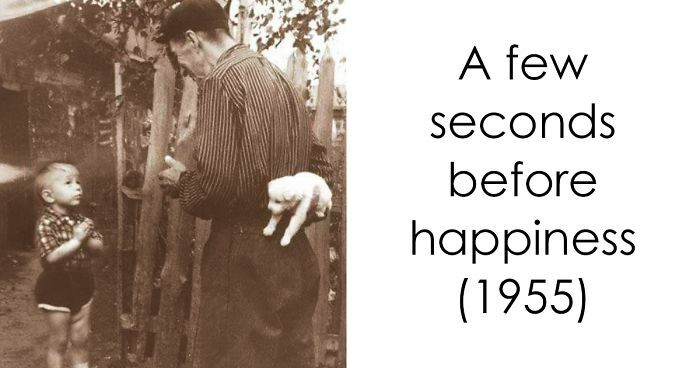 He Adopted The Kitten After The Mother Cat Died During The War. New shoes were a BIG thing during WWII. My grandmother told me how my grandfathers paycheck one time was enough to buy their groceries and some new shoes for my mom. Times were tough VERY tough in those days. Even the dog is smiling!! Both kitties are on their hind legs... pawsome! This is very moving..There was a young woman on the news last night,in the UK,who had just had implants fitted so she could hear sounds for the first time ever..Just as the specialist was about to Test her hearing,her boyfriend came into the room and asked if He could propose to her,as he wanted that to be the first words She could hear... She heard the words clearly and was crying through pure joy of hearing and those magical words.. But not as much as me...TWO hours later!!! It appears to be working. She's smiling! Cat not that happy =D but the girl is adorable! Awww they look so snuggly. That puppy is so happy! I believe the little dog was trying to get a room as it was the 'inn' thing to do. How suite. So universal. Kids and their play phones. Saipan, Ca.-in California? Isn't Saipan in the Pacific? Love the pic, these kind of war photos always renew my hope for humanity. dog looking majestic on the side. I would love to have this image up at home to remind me of how great it is to be alive. Norma Jean Baker was Marilyn Monroe. So this is the pre-blond Marilyn we're seeing. I love this. I had never seen it before. They dropped almost everything to embrace. I remember when you could truly swing on a swing. And you would try to go so high that you'd flip over the other side!! This sure breaks the stereotype of strict nuns most folks have.... especially from back in the day! Now THAT is what I'd call a bubble bath!!!!! If only the "Bay of Pigs" looked like this. everybody had cool shoes back then instead of jerky sneakers. What is the boy on the right looking at? This would have been extreme risque for the 30's. So I gotta wonder just why she was wearing a bathing suit in a house of mirrors? By '93 Saigon had been renamed to Ho Chi Minh City. #61 Me, Sitting On The Rail At Niagra Falls In 1956. Obviously you didn't slip backwards! #62 Taking His Cousin For A Wheelbarrow Ride 1948 Corley Moor, U.k. This is my dad, he loved his family and was always kind to everyone. It's not cool to kind to your younger female cousin but he didn't care. The turtle was Harriet, who passed away at Steve Irwins zoo, not that long ago, at 168 years old. So elegant, Like from a hollywood movie! #66 Guess I Was Meant To Love Home Remodeling And Construction Industry .. Me In 1951 Helping My Dad With New Garage !! After a hard days work, we have a hard evenings s rowing, such energy. That horse has a wild look in its eye!